Yoga means unity or oneness. This unity spiritually refers to union of the individual consciousness with the universal consciousness. On a more practical level, yoga is a means of balancing and harmonizing the body, mind and emotions. This is done through the practice of asana (postures), pranayama (breathing techniques) and meditation. During a yoga class students are expected to focus their attention on the present moment. In the present moment the mind does not project a story. Now is where we are in a natural state of being. With no attachments or judgement about the present moment. We simply are. This is Yoga. We are fully immersed in the present moment. Try all the styles and teachers and see which yoga style resonates with you. You don’t need to be flexible or fit to practice yoga. Yoga is for everybody and every body. All you need is your breath. Discover your body and make a new best friend. Hatha yoga is a gentle yoga class where yoga postures are held a little longer. The practitioner gets to explore the yoga posture in depth. The goal of Hatha yoga is to become more aware of life force energy (prana) and direct this energy to heal the body and focus the mind. After a Hatha Yoga class you will feel more relaxed, more in tune with your body and heightened awareness. Practice Hatha Yoga if you are a beginner, pregnant or if you are recovering from an injury. Vinyasa means conscious placement; being aware of each movement and linking your movement to the breath. Simply put, Vinyasa means flow. Classes are choreographed linking different poses together allowing the practitioner to transition smoothly. Each class is different. If you don’t like routine and like to work up a sweat, then you will enjoy Vinyasa! Teachers play music and the energy in this class is quite high. You will leave your mat feeling elevated, alive and vibrant. Vinyasa classes are both challenging and fun. ‘Budokon’ means ‘The way of the Warrior Spirit’. It’s inspired by Martial Arts and created by Cameron Shayne. 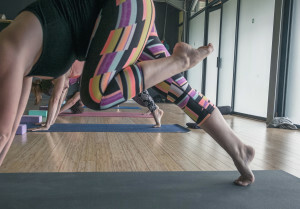 Expect a challenging yoga class that includes fluid, mindful movement and animal locomotion. In a Budokon class students bow to the warrior (change what you can) and the yogi (surrender to what you cannot change) within. 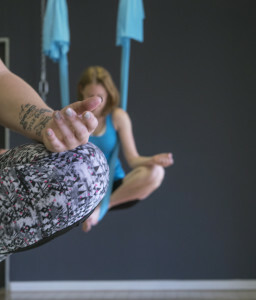 Sky yoga is a contemporary yoga style where traditional poses are performed with the aid of a fabric sling or hammock. Classes are fun, challenging and diverse. Inspired by the vinyasa style of yoga, the poses flow in creative sequences, your relationship to gravity is altered, your attention to balance and stability is heightened and your body is left stronger and more flexible. These classes are a delicious way to unwind and relax shattered nerves. 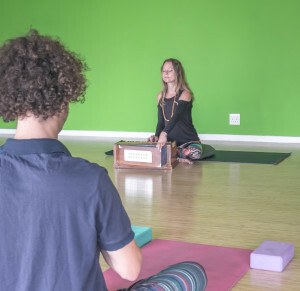 A lot of props are used in passive poses so that the practitioner can completely relax. The body can now experience the pose without exerting any effort. After this class you will feel rejuvenated. This builds a lot of flexibility as the practitioner goes deeper into the pose. 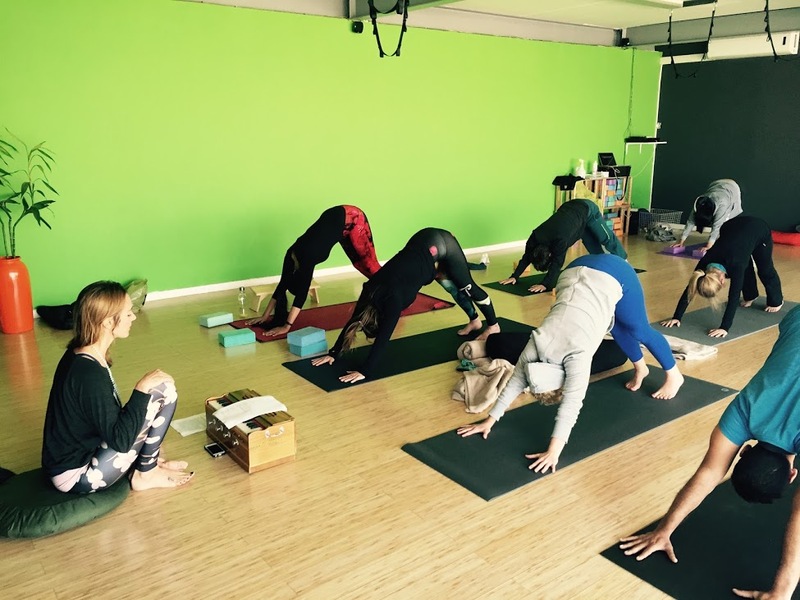 This class is recommended once a week to balance your Vinyasa (yang) practice. Kids have to move in different direction to increase their sense of space. Sky yoga does just that! 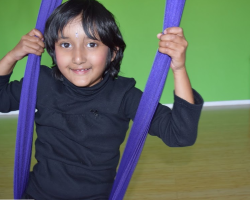 The aerial yoga sling is fun to climb, builds strength and develops fine motor skills. Allow your little monkey to use their energy in a creative and fun way. This class is open to kids 4 – 14 years old. Please book for this class. Research have shown that woman that do yoga during pregnancy experience an easier, as well as a shorter labour. Pregnancy yoga teaches moms to be present and go with the flow, so that they can handle the birth process however it may turn out. Calm mommy = calm baby. Pregnancy yoga will help you to realize your potential and help you savor and enjoy this time in your life. Acro Yoga is the combination of yoga and acrobatics. This practice cultivates trust, playfulness and community. Let your inner child free and join us on Friday nights from 6pm. This is a social class, laughter is encouraged. You don’t need a partner. You don’t need any yoga or acrobatic experience. 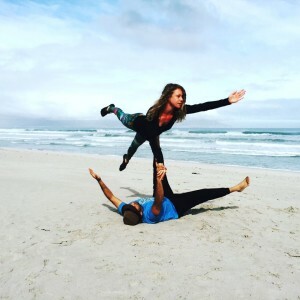 Everybody can do Acro Yoga! Play in a safe environment and be surprised by what you can do! Read more about other benefits of yoga and how yoga heals.